Articles History of Concrete Fastening Systems, Inc.
History of Concrete Fastening Systems, Inc.
Below is a detailed history of how Concrete Fastening Systems, Inc. grew into the company it is today. 1987- Bob Carlisle founded Wholesale Fasteners- a sole proprietorship of a concrete fastening systems business that sold products to end users. The main product lines included: concrete anchors, carbide bits, powder actuated nails and boosters. 1991- Wholesale Fasteners moved to its first warehouse on East 40th Street in Cleveland, Ohio. 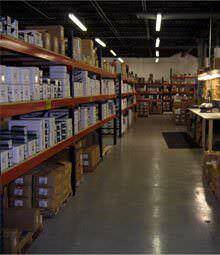 1993- Incorporated into Wholesale Fasteners Inc.
1994- Signed contract with Dual Bolt, Inc. to become its northeastern United States factor warehouse. Inventory grew to include: wedge anchors, stainless steel wedge anchors, hot dipped galvanized anchors, sleeve anchors, drop-in anchors, stainless steel drop-in anchors, split drive anchors, hammer drive anchors, and titen concrete screws. 1996- Simpson Strong Tie, Inc. purchased Dual Bolt and renamed the product line including Wedge-All® (wedge anchors), Titen® for masonry concrete screws and others. 1997- Wholesale Fasteners was renamed Concrete Fastening Systems, Inc. and began to sell to distributors. This ended business association with Simpson Strong-Tie. Acquired approval to use the Thunderstud brand name. Packaged all concrete fasteners under the Concrete Fastening Systems, Inc. name. Also started selling Tapcon® brand concrete screws manufactured by Elco, Inc.
1998- Developed catalog and point of purchase display for a complete line of concrete fasteners. Download the catalog here. 1999- Launched a website for Concrete Fastening Systems for marketing to distributors with a complete product line of all different types of concrete anchors for numerous applications. 2000- Updated website for eCommerce capabilities to allow internet users conveniently purchase concrete anchors online. 2002- Imported the first containers of concrete fasteners which included sleeve anchors, drop-in anchors, split drive anchors, hammer drive anchors, and strike anchors. 2003- Imported container of concrete screws as a less expensive alternative to Tapcon® screws. 2004- Launched product specific satellite sites to help customers more easily find the exact anchor that they need for a specific application. 2006- Moved to present site located at 1231 East 26th Street in Cleveland, Ohio and expanded into a 12,000 square foot warehouse and office. 2006 to the Present- Concrete Fastening Systems, Inc. and its employees continue to improve customer service and provide quality concrete anchors to advise to all types of customers ranging from the DIYer to major distributors and contractors.